Rafael Velasquez, MD, attended residency in family medicine at the University of Alabama in Birmingham, Alabama, and also completed a residency at Kansas University School of Medicine where he served as Chief Resident in Family Medicine. 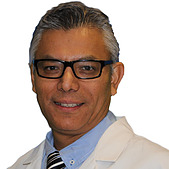 Dr. Velasquez was born in Lima, Peru, and graduated from Federico Villarreal School of Medicine in 1993. He worked with multiple volunteer programs in his native Peru, including the early detection of cervical/breast cancer, cholera prevention, and the Peruvian Red Cross. Dr. Valasquez is a member of the American Academy of Family Physicians (AAFP) and the American Medical Association. He enjoys karate, soccer, music, reading and spending time with friends and family.